I'm back with another quick pattern for you guys! This one is even easier and was actually born out of necessity. I think that's the great thing about being able to crochet. Once you have some experience with crocheting, it gets easier and easier to make things without a pattern at all. Take this next pattern for example: Coasters. I needed some coasters, so I crocheted some coasters. I could have gone online and probably found about a 100 similar patterns, but I felt like making and creating them all by myself! There's something so very satisfying about turning a ball of yarn into a useful product all by yourself! Don't you guys think? Do you ever look at a finished item and say to yourself: You used to be just yarn! The size of them will also completely depend on your hook size and the size of the yarn you'll be using. Now the one in the picture above, was made as a pattern prototype, and even though I think it looks really nice in that creamy white colour, it's not very practical as it's a wool mix yarn. It'll be hard to clean, and could potentially start to felt the longer you use it. I'd say the best types of yarn for coasters are "cotton" and "mercerised cotton". I've actually made similar ones before (I say similar, as I'm not quite sure if they are the same, I never wrote down the pattern when I last made them many years ago). Here's a picture I posted recently to our Instagram Page. I made them for our first apartment in Hamburg (which means they were made at least 5 years ago). I know it was made with mercerised cotton, and with a tiny hook (I remember how fidgety it was to get my hook through the stitches). I just don't fully remember if I used Double Crochets or Half Double Crochets. Not that it's really important. For this version of the pattern I chose to use Double Crochet stitches. If you don't want these to be TOO big, I'd suggest you to not use a yarn thicker than a DK weight. Also keep your hook size on the smaller side of the recommended size that is writing on the yarn label! 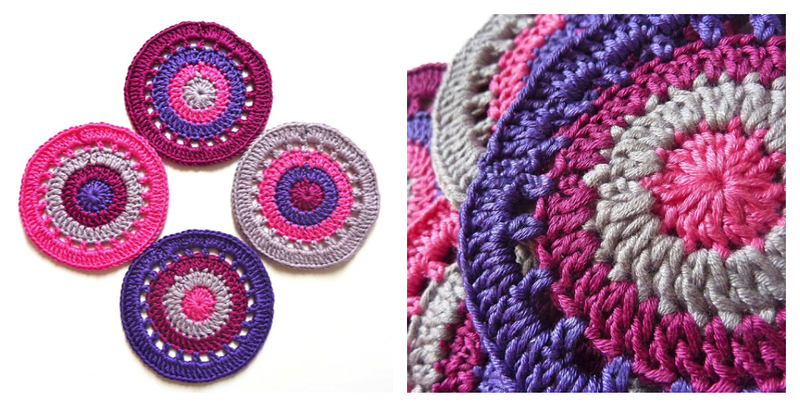 You want these stitches to be nice and tight, to create a sturdy and pretty coaster! And as always, if you have ANY questions, words of wisdom, praise, constructive criticism, or just want to talk, leave us a comment below, send us a message by owl (or using the contact link if you don't have an owl), or just scream really loud and hope we hear it all the way over in Germany! Have a lovely week everyone!! !